Pools are an incredibly useful exercise tool for anyone but specifically for anyone who needs low-impact, high-resistance exercise. In no other environment can you lift weights, move freely, and use your full range of motion with as little restriction or pain. And in no other situation can you leap and stretch to such a degree without risking injury to your joints. This makes pool-based exercise a critical part of healthy life for many walks of life. Retired seniors, pregnant mothers, and injury survivors can all benefit from daily low-impact pool exercises just as much as anyone else (and you don't even have to swim laps). If swimming is not your thing, or you're just looking to mix up your routine, you can still enjoy a full range of exercise benefits from your swimming pool. Check out the top 18 pool exercises (that aren't swimming) and pick your favorites to try today! The pendulum swing focuses on your legs and core abdomen muscles. Stand with your back to the pool edge and your hands or elbows on the pool wall to hold you up. Bring your legs together and pointed down. Slowly raise your right leg sideways, up along the pool wall, as high as you can. Then lower it back to center and repeat with your left leg. Like a pendulum. Continue lifting one leg to the side and then the other for the number of reps you are comfortable with. Leg lifts also start with your back to the wall and your elbows on the water-level edge. Put your legs together and pointed down. Lift both of your legs together at the same time out in front of you to waist-level and lower them again. This is a fantastic workout for your core! Flutter kicks are quick, rapid kicks with most of the motion happening from the knees down. But to practice these, you'd wind up pushing yourself around the pool. So instead, brace your arms on the pool wall and kick; you can do this facing either direction. Whatever is most comfortable for you. Scissor kicks are more specific and precise. With your back to the pool wall, let your legs float up comfortably. Kick your legs apart, then quickly back together with one ankle crossing over the other. Then apart and come together with the other ankle on top. Kick and repeat for as long as you can. Seal push ups are when you push yourself up out of the pool using the edge. Then drop down and push back up again. They use the water's support for part of the push and are easier to do if you kick off of the pool floor or wall. These are a great way to work your upper arms and body control. Tricep dips are like seal push ups only facing the other direction. Brace your hands on the water-level pool rail behind you, just outside the width of your hips. Then push upward until your elbows are nearly straight and you are holding up your weight. Then drop and repeat. This is great for your triceps and is QUITE a challenge. Ladder pull-ups are an amazing way to train your pull-up muscles without using the full weight of your body. Grasp the pool ladder with both hands at the same height and pull yourself out. Then drop back and pull yourself out again. The buoyancy of the water will make this exercise much easier than usual. Some pool exercises are easier to do with a noodle, which is a cheap, fun, and readily accessible workout tool. These exercises will use a little bit of buoyancy and stabilization to help aid in the exercise and strengthen your core. Start by leaning back on the noodle under your arms and shoulders. Stretch out your legs and leg them float to their natural level. Then pull your legs up to your chest in a crunch and stretch them out again. Repeat until your core burns. You can also flutter-kick with the noodle. Lean back into the noodle and extend your feet, then flutter kick. Try to keep your feet completely under water to get the most resistance and propulsion. This is also a great way to jet around the pool. Sit on the noodle as if it were a bicycle and tread lightly with your arms to keep your head above water. Now peddle your legs and imagine a real bicycle. It may help to hold onto to a second, horizontal pool noddle or to pump your arms as if you are jogging. A plank is the position you get into to do a push up. You can exercise the same muscles in the pool with no impact and less gravity using a pool noodle. Hold the noodle between your hands and place your toes together on the shallow-end floor. Arrange your body in plank-position, pushing the noodle down to become your floating base. You will be at an inclined angle. Hold yourself rigid or go for the gold and do some push ups. Yes, you read that correctly. Grasping each end of your pool noodle, swing it over your head, then force it under the water and jump over it. The effort to do that many times is an undeniable workout. Some exercises assume you are in the shallow end or have found the perfect grade to bounce on your tip-toes with your head out of the water. These exercises require a small amount of bouncing off the pool floor. Jumping jacks are high-impact for high results out of the pool. But in the pool, they take on an entirely different workout effect. The water pushes against the wide movements, but jumping doesn't come with hard landings. Forcing your body to go through the jumping jack motions in the water is a great muscle workout against water resistance without the typical pressure put on your joints. You can also use all your intense running muscles in the pool by going nowhere or moving very slowly. Try jogging in place in the water, then running full-tilt without going anywhere. You will only need to occasionally touch off the bottom of the pool but you will feel the muscles that you are working. Squat jumps are perhaps the most intense non-swimming pool exercise. Start in the shallow end and crouch down low in the water. Arrange your legs like a frog or plie. Then leap up and out of the water as far as you can, and take a breath while you're above the surface. When you fall from your leap, return to a crouched position and repeat. Water treading exercises assume you are in the deep end, or staying off the pool floor, with part of the exercise is keeping your head and shoulders above the surface. Sculling is when you tuck your knees up to your chest and tread water just using your hands. It's a skill but it also works your biceps and forearms very quickly. If you get good at sculling, try it with your legs extended in front of you and toes sticking out of the water. Quick cycle is like the noodle bicycle only faster. Use the quick pedaling of your legs and any necessary movement of your arms to tread water and burn calories. Otter rolls are something almost anyone can do. All you need is some kind of flotation device; a noodle, a boogie board, a beach ball, anything will do. Clutch it tightly to your chest and float on your stomach. When you're ready, try to roll to you your back and then come back up so you're on your stomach again. Once you've mastered rolling one direction, practice rolling the other. 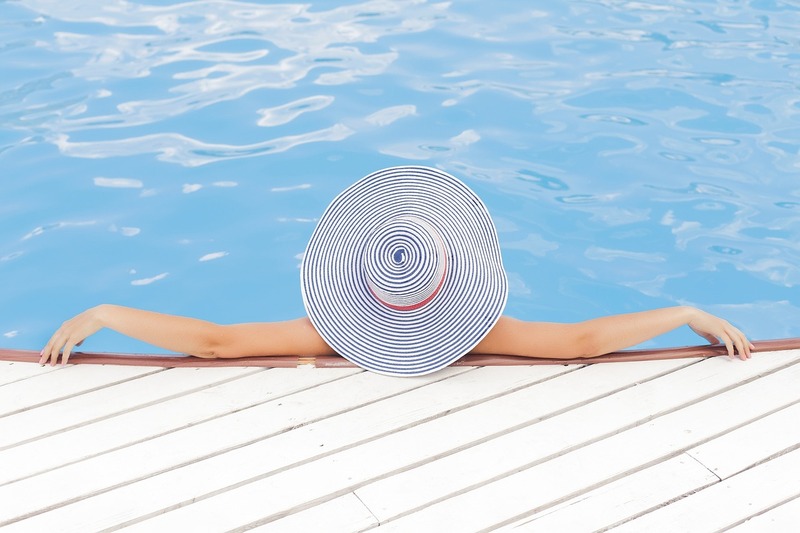 You don't have to swim to enjoy the health and exercise benefits of a pool. With these basic techniques, anyone can work out in the pool whether or not you're good at actually swimming.